Typical Ancient Greek House A, complete with altars, well and complete usable interiors. 38 Textures. HD and LoPoly Roof. HiDetails. Faithful accurate Reconstruction. C4D, 3DS, OBJ from VUE6 to VUE11. _________________________________________ Typical Ancient Greek House A, complete with altars, well and complete usable interiors. 38 textures. HD and LoPoly Roof System. Complete Interiors. Doors, Windows shutters. 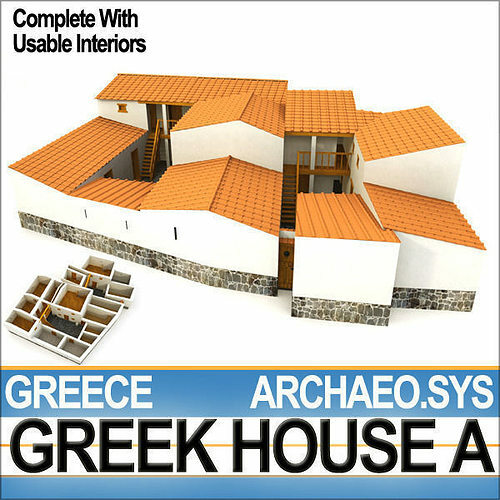 Faithful and accurate Reconstruction of an Ancient Greek House with complete Interiors, ing to the Scientific Data and the Archaeological Evidence. In the package you will find: 1- typical Ancient Greek House with 2 Courtyards with Ground Floor and 1st Floor; 2- complete Interiors with Stairways, movable Doors and removable Window Shutters; 3- 2 Altars; 4- 1 Well; 5- 1 HD Roof System; 6- 1 LoPoly Roof System; 7- 38 Hi-Quality Hi-Def PhotoReal Textures [2072x2072; 1257x2576; 1800x780; 600x1600; 1500x1500; 1400x1000; 900x900 etc. ]; 8- Alternate Textures and 1 UV Map to customize and create different types of elements; 9- .txt guides to the correct rendering; 10- Real World Scale SmartCgArt Man Reference System with models [C4D, VUE, 3DS, OBJ, DXF].